Marco Melandri (Ducati) won the first race of the 2018 WSB championship series at Phillip Island earlier today. Melandri caught, and passed, the two Kawasaki factory riders, Tom Sykes and Jonathan Rea, who had taken the early lead in the race. Although Sykes held on to take 2nd place at the line, defending champ Rea continued to fade and finished in 5th position. Ducati’s Chaz Davies took the final spot on the podium. You will find full results to Race 1 here. For additional details and points, visit the official WSB site. Stay tuned for an MD report on Race 2 tomorrow. It seems that electronics have muted the natural advantage that a V-Twin used to have. In an ideal world, you’d have some weekends favouring the twins (historically slower, tighter tracks) and others suiting the 4-cylinder bikes. Of course, the best riders and teams will always have some natural (and deserved) advantages no matter what. The rev limit that is being implied has a relationship to the donor road-bike’s rev limit too, so there’s a link to the road machine that makes this more paletable. Can we expect a repeat of the Yamaha R6 debacle with it’s 17,000 rpm red line (scandal)? Possibly not, due to the consumer fall-out that followed that episode. This is all a far cry from the Aprilia winning bikes of Biaggi, which changed to gear-driven cams for the race track! How that was allowed to run is something of a disgrace. Oh look, a little imp and his two guards. “Did y’all forget the new rules mostly applied to Kawasaki so they would not run away again? I didn’t pay attention during this past offseason, so if WSB made these rules changes, I missed the announcement. All I can say is, if this is true, it’s an utter disgrace. It was already laughable last year, when they tried to rig the system by penalizing the Race 1 winner with a poor grid-position for Race 2, but this is just downright disgusting. Targeting a single manufacturer by hitting them with their own specific RPM ceiling, which can be lowered even further later, whenever the WSB desires? If I’m Kawasaki, I tell them to stuff it. If WSB is that desperate for Ducati to win, fine, give them their own Ducati Cup series. This is ludicrous. This is a slap in the face to the very spirit of racing. But VLJ, the RPM limitations apply to Ducati as well as Kawasaki, both who did well last season. They’re saying that the Kawi is limited to 14,100, not 14,700, and that WSB retains the right to lower it further on the Kawi. The Ducati is also subject to handicapping because of their success last year. WSBK has no particular love for Ducati, they just need to ensure some level of parity so that other teams have a chance. The field used to be Hopping with Ducatis, now there are 3 including the factory bikes? WSBK is looking like MotoGP did some years back, when only 4 bikes in the grid had a chance to win, and teams were leaving left & right. It’s a shame, just a few years ago, almost all brands had a win capable bike in the field. The KRT team is dominating because they’re the only ones really trying. You’ll notice the other ZX10rr’s all finish way down in the order. 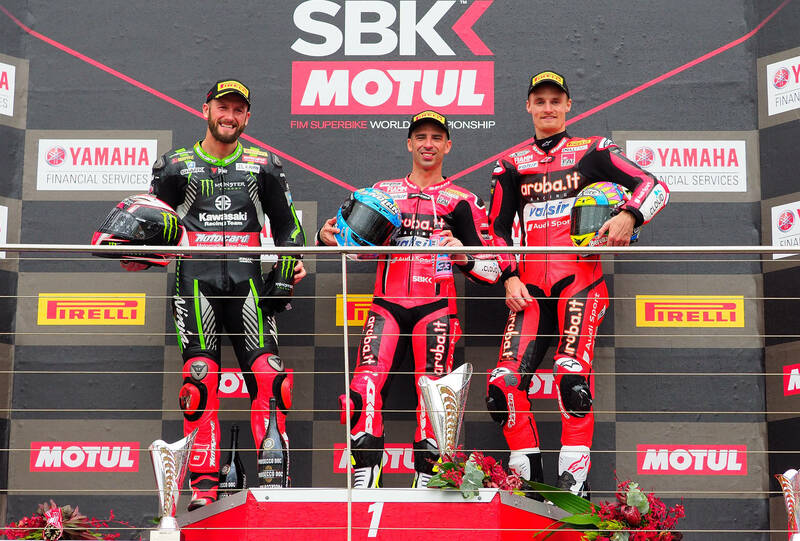 WSBK needs to fix it, or the series dies. Correct, the Ducati is limited to 12400 I believe, which essentially works out to the the same “penalty” afforded to Kawasaki. WSBK is trying to let the rest if the grid catch up to these two teams. The rev limits are technically a new rule, but this replaces the previous rule on intake air restrictors which teams had gotten pretty good at working around. Engine development during the season is also closed to Kawasaki and Ducati. WSB retains the right to raise or lower the rev limit on any bike on the grid during the season, not just Kawasaki. But it will likely only be Kawasaki. I’m kinda with you VLJ. At this point, is it really racing? KHI apparently still finds good value for money spent chasing the Championship. Most including Kawasaki realize the end of competition = the end of WSB (see the last 3 years at least). If/when better advice exists I’m sure WSB would love to hear it. Did y’all forget the new rules mostly applied to Kawasaki so they would not run away again? 4 cylinder engines limited to 14,700 except Kawasaki limited to 14,100? Ducati was at the limit with stroke as short as possible to allow acceptable piston speeds for a twin and bikes became super peaky and hard to ride. Remember the good old days when there were 4,5,6, and 8 cylinder engines? When there is an arbitrary limit to engine size, more cylinders make more HP. Now to “keep costs down” there is also an arbitrary limit to # of cylinders. Racing is a show and rules are there to keep it entertaining. Oh goody. We’re back to Ducati winning with the rulebook. How so? Do you mean the extra 198cc? That hardly offsets having two fewer cylinders and a more than 2000rpm lower redline. The fact is, the extra cc’s have never resulted in an HP advantage over the I4’s. Without them, Dicati would simply not participate and without them, it is possible that WSBK might not have survived some of the past lean years. I think they did well today by managing their tires better, which sounds like it was a problem for everyone. How do? They changed the rules so 4 cylinder bikes could only rev to 14700. But wait Kawasaki keeps beating are beloved Italian brand so they can only rev to 14200 and we have the option of slowing them down more during the season if that is not enough. The beat everyone else even worse. If the rules don’t ensure some level of competitiveness within the budgets that the average team can muster, they leave. Nobody will tune in and watch. We saw this with MotoGP, it almost died. The extra CCs afforded to the Twins haven’t necessarily resulted in increased horsepower over the Fours, but they have resulted in superior torque, smoother power delivery, and, most importantly, reduced tire wear. The necessarily peakier powerbands of the smaller Fours has always been their Achilles’ heel, vs the larger Ducati Twins. Back during his AMA Superbike days, I once spoke at length with Mat Mladin outside his pit box at Sears Point. This was during the era when the Fours were limited to 750 CCs, and the Ducati Twins were allowed 1000 CCs. I congratulated Mat on his dominating qualifying run, but he waved off my congratulations, explaining with obvious concern and bitterness that it was all a mirage. Sure, for one lap he was able to pull a rabbit out of the hat, but he knew he would absolutely chew up his tires during the course of the race, trying to keep pace with the far superior corner-exit grunt of the Ducatis, which were so much easier on their tires. He added that his only chance of winning was to break away early and build up a large enough lead that he might be able to nurse it home ahead of the late-charging Ducatis. Sometimes it worked, if the Ducatis were held up in traffic enough that the deficit grew too large; other times, if they managed to remain in touch with him throughout the race, he knew he was a sitting duck at the end. He explained that it was all down to the extra 250 CCs advantage they enjoyed. He had to over-ride the bike to have a chance at beating them. The advantage in reduced tire-wear they enjoyed as a result of that extra grunt made for a completely uneven playing field. He told me to watch for it in the race. Mat Mladin was a very intelligent, calculating rider. He always knew exactly what was going on, both with his bike and everyone else’s. One of the reasons he always came across in the media as so bitter and angry was because he was, in fact, bitter and angry. He knew the politics involved, how they were wildly tilted to favor the Ducatis, which the organizing bodies felt was necessary to keep the various series from being All Japanese affairs. “It’s not racing…it’s not engineering. It’s rule-book mucking about,” he said. And he was absolutely correct. He still is. I’ve been one of the loudest V-twin proponents around; I didn’t like Ducati’s move to the V4 superbike. It’s early in the racing season, of course, but I did enjoy watching the V-TWIN Ducatis run down the 4-cylinder bikes and finish 1-3-4. Who says they had run out of improvements to the V-twin format – they looked pretty racy down those straights to me. What didn’t look as good was the wobbling tendency down the straights. Maybe they should have kept the Superquadro motor, rotated it backwards to a 42 degree angle and added more frame connections like they did to the new V4. well it’s Phil’s Isle and density/altitude sea level so pretty much everything and their nana (cept for GP17’s apparently) goes good there. as you likely know this is the ultimate “bogey track” and not really the best determiner of performance, but alas we’ve gotta start the season somewhere. A: his name is Euro4 and he’s a mean one Mr. Grinch. that is, if they ever resurrect from their latest downturn. Euro4 is about production bikes, not race bikes. Yes, twins need larger mufflers than fours, but there are ways to accommodate that requirement. My point: The primary reason Ducati moved to the V4 format is to leverage their motoGP investment, not because the twin format was played out. The reason they use a V4 in MotoGP is because the twin format is played out. The motoGP rules favor 4-cylinder engines, which is why all the manufacturers have ended up with that configuration. Jeremy, if the twin format is “played out”, what is it that fours can do that twins can’t, specifically? Please don’t tell me “rev higher”, as we all know the fours shorter stroke enables that, which is why twins are allowed more displacement to equalize performance. Actually, fours have more valve area which is what the displacement advantage given to twins is really compensating for. Either configuration can spin to the moon if designed to do so. What I mean by the twins being played out is that they have reached their zenith under current WSBK rules. Hats off to Ducati… They’ve made a 1.2 liter twin as competitive as it can be (I mean really, they can lay the whole grid to waste except for Kawasaki) while still having a core product that is streetable enough to sell to the public. For that twin to get any more competitive, they either need for the rule to permit more displacement or create a street bike engine that is so peaky that it becomes utterly miserable as a street machine. I’ve never ridden one, but I read that the 1199 Panigale was missing all of the magic that twin sport bike fans had grown to love. Thus the 1299. There is more than rev higher. Smaller parts; hence lighter reciprocating parts is what allows the higher rev ceiling but there are other things into the equation. As Norm said one day very long time ago, engines are basically aspirators, when the piston goes down it aspirates air, the thing is the bigger the piston the more air it has to be aspirated and the more critical it becomes to do so as the more air the more fuel you can burn (I’m overlooking a lot of variables here, efficiency, tricks like fuel injection for better efficiency, better fuel atomization, air swirls, engine combustion chamber design, position of spark plug, valve design, valve angle, etc…). Smaller pistons are also more efficient at that, aspirating the air they need (I did my google fu but I were not able to find a study to back this claim), the reason goes down to the valve configuration. Maybe the biggest exponent (albeit a failed experiment) in the Honda NSR800, as Honda was limited to a 4 cylinder configuration they went into oval pistons. WSBK is about HOMOLOGATION of production bikes which must adhere to Euro4. it’s the old chicken V. egg conundrum. only after a punter puts a spanner to them do they then become “race bikes”. But Norm, Ducati sells the 1299 Final Edition and Panigale 959 models, both which meet Euro4 emissions requirements, so it can be done. Yes, but keep in mind that the 1299 is effectively the consumer replacement for the 1199 as the 959 is the replacement for the 848. They have to grow displacement to make the power their customers expect from bikes of their class. I’m not hating on twins, but I do think Ducati’s transition to the V4 was inevitable things being as they are. They need to race what they sell, and the rules won’t let them race a 1299. I also think that there is some validity to your earlier statement regarding Ducati leveraging the MotoGP connection with the V4. It only makes sense that they would do that eventually, and GP lessons learned will trickle down quickly to WSBK world amplifying Ducati’s threat to the grid even more. They have run out of improvements for V2. From what I’ve read, the latest iterations of the street Panigale behave more like I4’s than many I4’s do (peaky, lack of low RPM torque). Read about the new V4 bike. Despite being the most powerful Ducati ever, everyone talks about how easy the engine is to use. These problems are only magnified in the race environment. Come on guys, 4-cycle engines are still undergoing efficiency improvements, especially in the automotive world. There is nothing you can do to a 4-cylinder motorcycle engine you can’t do to a similar twin. I’m very familiar with Ducati’s new V4 and it appears to be a great bike, but what Ducati’s direction has done is eliminated consumer choice in the marketplace. Now the question is “which 4-cylinder do I want?” instead of “Do I want a twin or a four?”. Perhaps not everyone wants a bike that is “easy to use”. Sure there is. You can process more air and fuel at a given displacement and make more power. This is the whole reason twins are allowed a displacement advantage. If it (the extra cc’s) were enough, Ducati would’ve stayed with the v-twin. The GP effort may have a marketing connection, but I really doubt they’re sharing parts with the street bike. Dave, the extra displacement given to twins is to compensate for its longer stroke versus fours of the same size, which limits maximum piston speeds (RPMs) and , therefor, maximum HP production, since HP is directly related to RPMs. No engine can “spin to the moon” in RPMs – there is a mechanical limit to every engine based on piston speeds due to current metallurgy/lubricant technologies. Yes, I know that. That is one of the reasons why a 4 cylinder engine can process more air and fuel. Ducati has continually shortened the stroke of its twin to the point that chasing revs has caused them to forfeit some of the characteristics that made people love riding twins. mandatory pit stop for Race 2 fellas due to tyre degradation and Yonny taking a digger. the Pirelli dictate coming down from on high is no more than 12 laps. did marco get a new wife too?